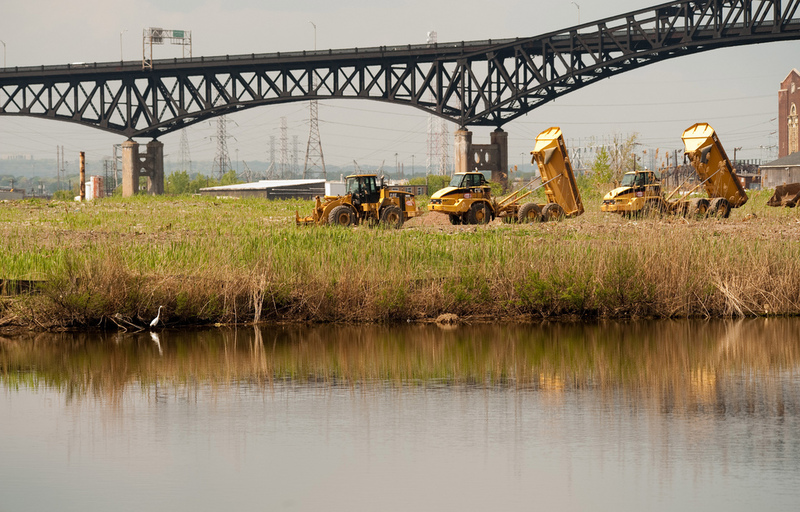 Heavy equipment removes dredge and landfill material from this site of marsh restoration in Lincoln Park, New Jersey. NOAA and partner agencies often then reach a legal settlement with a responsible party (RP)The individuals, companies, or government agencies responsible for an oil spill, hazardous substance release, or ship grounding incident. that ensures payment of costs for both assessment and restoration. A settlement may include terms outlining additional restoration planning, steps for implementation, and monitoring of restoration projects. the RP may perform the restoration while NOAA and trustee partners oversee and monitor the results. For oil spills, RPs may be liable only for damages up to a certain amount. The RP might reach its limit of liability before assessment costs are fully reimbursed and restoration funded. An RP might also simply refuse to pay a claim, or it may not be possible to identify the RP. In these cases, NOAA can submit a claim to the Oil Spill Liability Trust Fund seeking additional assessment and restoration funds. When an RP refuses to pay, but has not reached its liability limit, the administrators of the Fund may seek to recover from the RP the amount of claims paid by the Fund.